Yesterday was a holiday in Canada, Victoria Day. Thank you Queen Victoria for giving me a day off work! On the long weekend I went to a craft show in the Distillery District and I bought this little pinafore. I actually wore these shoes YESTERDAY too. What's wrong with me?? I want one of these pinafores for every day of the week! and it has this pocket which is great for my security pass and kleenex and the like. 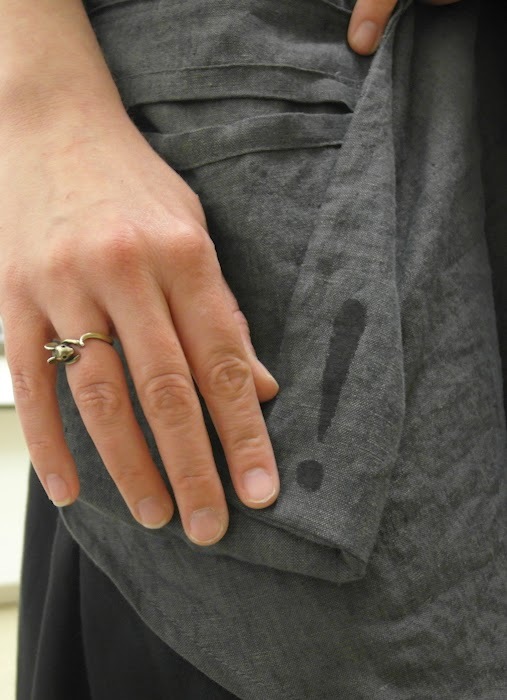 An Exclamation Point on the underside of the pocket! Oooo, I love little hidden surprises like that! And the deconstructed style is cool. I think I'm always to timid with clothes like that - you need to try them on to see how great it looks! That pinafore is smashing - you look so good in it. I love the Prepare Guides - so comfy! I loved the little mouse ring when I saw it on your Instagram - it reminded me of Fred. I understand the love of the pinafore (isn't that a cool word); it will be a great summer layering piece. I wonder how hard it would be to make something like that? It would be fun to have one in a few different colours.